The genus Boronia contains about sixty species, but they are all confined to Australia, though within the limits of the Commonwealth they are very widely dispersed. It belongs to the family Rutaceae, a large, very natural group of worldwide distribution, so named from Rue, a common European herb. The citrus fruiting shrubs, Orange, Lemon, and such, are well-known members of the family. All the group are noted for the aromatic properties they possess. This, generally, is apparent in the oil dots in the leaves and on the green stems, a condition we have already met with amongst the Myrtles. We have six forms of Boronia, besides many other shrubs belonging to closely-related genera. All the Boronias have their leaves placed in opposite pairs. In some species the leaves are of simple outline, while in others they are divided into linear segments. The form that is most likely to be gathered by a young student is the one commonly known as Pink Boronia. 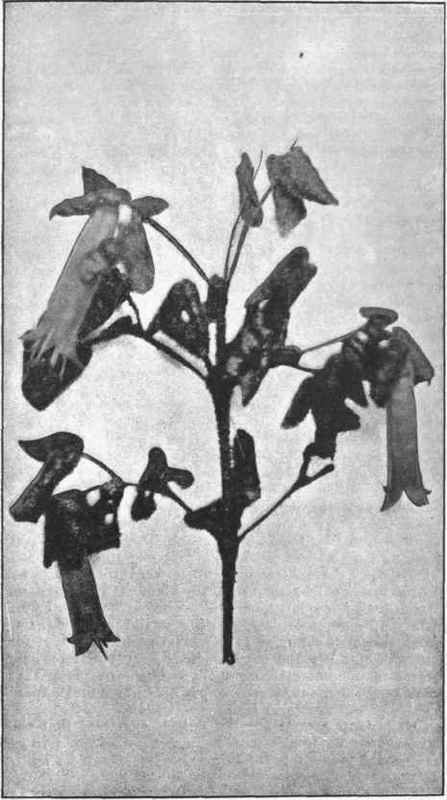 It is commonly divided into two or three species, a fact that need not trouble us here; The leaves are divided into five to nine linear leaflets arranged in pairs. The flowers are pink, or nearly white, and borne in little loose bunches in the upper leaf axils. In general appearance the structure is very much as we found it in Purple Heather. The sepals are four, and inserted close below the other parts at the top of the flower-stalk; that is to say, the flower-stalk does not expand above into any form of tube as we found in Roses and Myrtles. The petals are also four in number, and are quite free from one another. There are eight free stamens. The filaments are well-developed, and bear gland-like nodules on their surface, besides being adorned with delicate hairs. The anthers are small, round, and inserted a little below the apex of the filament. The pistil is not at all sunk in the thalamus, and is formed of four distinct, or nearly distinct, carpels, which have one common erect style with a round terminal stigma. There are two ovules formed in each carpel. Between the stamens and pistil there is developed a thick fleshy ring, called a disc. Its use appears to be to supply attractive juice to visiting insects. This disc is a marked feature, not only of this, but several adjoining families. It is not one of the typical parts of a flower, but is so constant amongst these families as to be of considerable use in classifying them. In fruiting the carpels are not much changed; they only become larger and tougher, and split at maturity in two, to allow the seeds to escape. Very commonly only one or two of the carpels set seed, when the others appear only as little shrunken objects. Pink Boronia may be considered as one variable species, or many distinct ones, according to the disposition of the observer; but whichever course is pursued there is only a trifling and inconstant difference in structure. Our commonest form (B. pinnata) is a small erect shrub, bearing copious flowers, which generally are quite half an inch across. It is mostly found towards the coast. In wet places inland is another form (B. pilosa) of more slender habit. It is more clothed with hairs, and has smaller flowers; the first pair of leaflets are placed lower down the leaf-stalk than in the last, and the filaments are less hairy. A third variety is plentiful on some mountain plains. It is very like the first, only is less erect and the leaflets are more fleshy and often reduced in number; but it is chiefly noticeable for emitting a strong odour of citrons (B. citriodora). We have two little Boronias very common in sandy places and wet heathy country, with white petals often not larger than the sepals and simple narrow leaves. They bear few flowers, and those are placed singly in the leaf axils. Being small and of no great beauty, they are easily overlooked, and have not received popular names. The other two specie? are not sufficiently common to some within our range. A common shrub in the bush, belonging to a neighbouring genus, has received the very unpleasant name of Stink-wood. This name is too well fixed to be successfully changed, so, with an apology for its vulgarity, we must use it Stinkwood is a tall shrub, with opposite leaves each divided into three rather large flat leaflets. 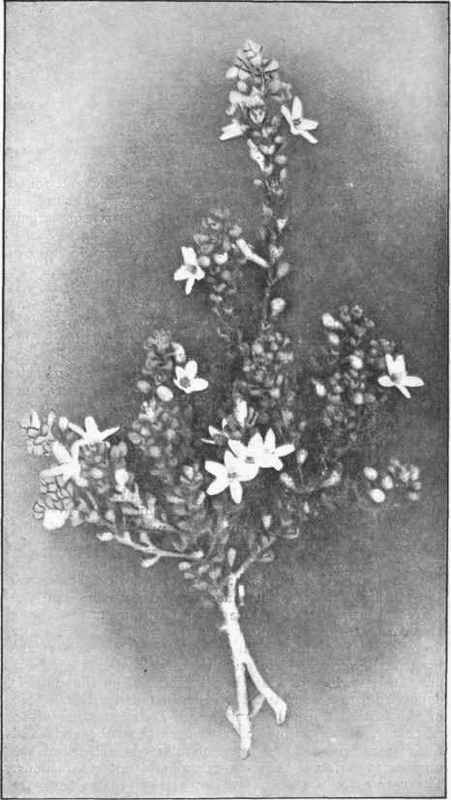 The flowers are about a third of an inch across, white, and many together in branched inflorescences, placed in the upper axils. They differ from the structure of Boronia in little except that there are four stamens instead of eight. The plant owes its name to the odour given forth when the leaves are crushed, which most people consider unpleasant. It has often been blamed for poisoning cattle, whether rightly so is not proved; but it is at least probable that it may so act when a beast is in low condition has little else to eat. Many different plants are from time to time blamed for the death of stock. Proof is very simple, and it seems a pity experiments are not carried out to clearly decide which of our plants are injurious. Another genus allied to Boronia is Eriostemon, which may be translated to mean Lovely Stamen, yet it must not be considered to mean its stamens are more beautiful than those of Boronia, for they are not. The principal mark of difference is that the leaves are of simple outline instead of being divided, and are arranged alternately instead of in opposite pairs. The flowers also have generally five sepals and petals and ten stamens; otherwise they are as in Boronia. We have seven Eriostemons; the commonest are Wax Flower and Lancewood. Wax Flower is a pretty litle shrub, which prefers to grow almost flat on the ground. The leaves are small, and they are covered with little oil-bearing knobs. The flowers are very pretty, with five waxy white or pink spreading petals. Lancewood, also called Hickory, is an erect-growing shrub or small tree, with flat lance-shaped leaves, which are silvery-white on the under surface. Native Fuchsia does not look at all like Boronia; from a distance, and only from a distance, it looks more like a Fuchsia. When its structure is carefully examined its true relationship is apparent. It belongs to the genus Correa, which is an easy name, and for the sake of accuracy its use should be encouraged. We have three common Correas, two of which may occur in almost any locality; the third, White Correa, is confined to the sea coast. The two of wide distribution are so much alike that they pass for one kind in general talk, and together are referred to as Fuchsia. The leaves are opposite, broad and flat, or marked with blisterlike convexities. The flowers are peculiar. The calyx is like a small brown cup with four minute teeth. The petals, of which there are four, are about an inch long, and united for the greater part of their length to form a tubular corolla, which is generally green or yellowish, but sometimes crimson, or partly so. The eight stamens have long filaments. The pistil is shaped as in Boronia. White Correa differs in the petals being white, free, and spreading from the base. The flowers in this genus are usually solitary in the upper leaf axils, or may terminate the branches. Years ago people had great faith in the medicinal properties of plants. Virtue of some sort was supposed to belong to the extracts of nearly all. Then such a familyas Rutaceae, which is marked by many odours, some-pleasant, many otherwise, and all of an abominable taste, commended itself greatly to the credulous. Any disturbance of the functions, if it did not kill, was supposed to be of benefit. There is little doubt that as far as mere-disturbance is concerned, this family is eminently suited to do that. But the more scientific the medical profession has become, the more has it lost faith, till now the greater number of the nasty-tasting herbs are left alone. In any family producing aromatic oils, such as this and the Myrtles, the production never appears to be confined to one oil. 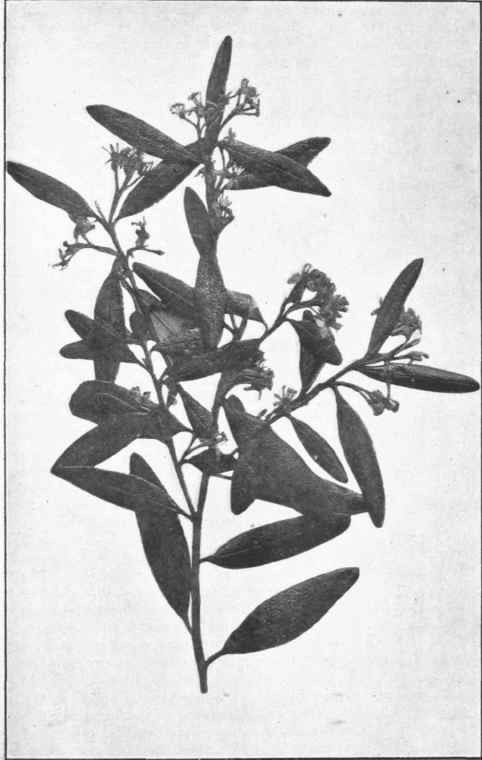 Each species, or group of closely allied species, certainly construct the same, and that without any reference to the soil in which the plant lives; thus, Peppermint Gum and its immediate allies produce one group of extracts which differ from the extracts of any other Euca-lypt, so that it would be quite possible to identify such a Gum by analysing its oils. But though the product of a plant is constant in character, sometimes a peculiar oil crops up in plants of many different families. The extract that gives us the scent of citron is not only produced by Citron, but by the Boronia we have referred to, by a member of the Foxglove family, a Eucalypt, a Thyme, and a Grass. These oils appear to be useless by-products formed by the plant in the process, of nutrition and growth, and as the plant has no means of throwing them off, it stores them up in cells so as to get them away from its actively-living parts. This would mean such a plant has not the power of making the best use of its food. Such an assertion sounds like rank heresy to those who see a beautifully accurate adaptation in everything. Many explanations have been brought forward to prove these by-products are of great use to the plant. It is sometimes claimed they render them distasteful to animals. Certainly, in some cases, they afford a partial protection, but often, when we desire to gather a sprig of a Eucalypt for our collection, we find not a single twig on the tree whose leaves are not more or less spoilt in shape by pieces that have been eaten out by insects. If browsing animals spare some of our Boronias, it is only because they are too small to claim their attention. It has been suggested that the oils evaporating from a modified atmosphere surround and protect the plant from the injurious effect of intense light. It is probable no one properly acquainted with Australian conditions will waste time in attempting to refute this.